Home » comedy , humor , mad magazine , milestones » Don't be cheap: Buy MAD MAGAZINE #500! Don't be cheap: Buy MAD MAGAZINE #500! It didn't hit me until a few months ago how much MAD Magazine has influenced my life. You can see it on this blog even: my propensity toward emboldening words a lot? That's definitely something I picked up from MAD's style... along with a jillion other traits, large and small that have crept into my work. I've been been of the school of thought that MAD has suffered a decline in quality ever since the mag made the decision ten years ago to not just run real advertisements but worse: to shift from black/white to color. MAD never needed color. It was like when The Andy Griffith Show dropped grayscale: darn few of the color episodes were anywhere as funny as the first few seasons. No, MAD's allure was always the quality of its content, not its chroma. 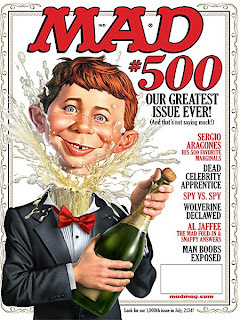 But even so, MAD Magazine is now celebrating it's FIVE-HUNDREDTH ISSUE! It's on newsstands now and if you're anything at all of a MAD-man (or MAD-woman) you owe it to yourself to pick this up... and pays the money 'course. In the issue Sergio Aragones publishes a gallery of the 500 favorite "marginal" cartoons that he's done in his nearly 50 years with MAD. There are also no real-world advertisements in the issue past the first few pages (apart from officially sanctioned MAD schlock). This issue is a huge throwback to the MAD that many of us fondly grew up with. Unfortunately #500 will be the last issue before MAD goes to quarterly publication: a consequence of the current economy that is hilariously lampooned (along with a rather vicious treatment of Barack Obama and Nancy Pelosi) in Frank Jacobs' song parody "The Bailout Hymn of the Republic".